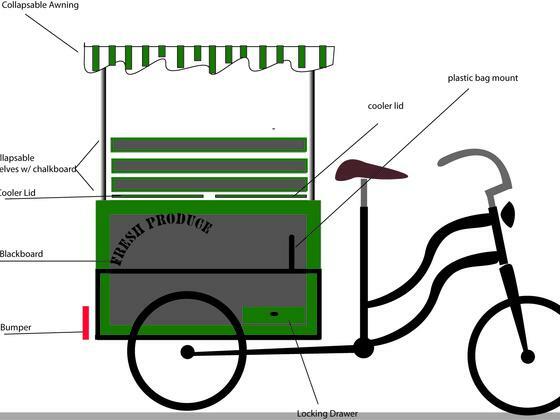 Support This Pedal-Powered Food Cart on Kickstarter! A Cincinnati-based urban farm program has developed a cart for transporting fresh veggies to market. In the wake of the urban farm movement, Permaganic Eco Garden is seeking funding to support the development and production of a pedal powered tricycle. In addition to lowering the carbon footprint of transporting their produce, Permaganic is hoping to add new charm to the city with these trikes. Designed locally, the trike will allow farmers to transport Permaganic produce to the Findlay Market and the Northside Farmers Market in Cincinnati. The trike includes an insulated storage box and the display stand for selling the produce. Everything a farmer needs to transport and sell their goods in one system! To support the project please visit their Kickstarter Campaign here. The Fairtrade Foundation has revealed it is planning to expand efforts to help farmers adapt to climate change and embrace environmental best practices, on the back of a surge in sales that saw the market for Fairtrade-certified products grow 12 per cent last year. Marking the launch of the annual Fairtrade Fortnight, the foundation today released new figures showing that sales of certified products grew from £1.17bn in 2010 to £1.32bn last year, defying the wider downward trend across the retail sector. The surge in sales has been largely driven by retailers switching entire brands and product ranges to Fairtrade – a scenario that led to a 34 per cent increase in Fairtrade cocoa sales and and 21 per cent increase in the Fairtrade sugar market. The organisation also predicted the expansion is likely to continue, after a number of high-profile retailers made fresh commitments to expand their Fairtrade offering. Beeswax is good for so much more than just candlemaking and nature crafts. In particular, beeswax is an ingredient that I find myself using often in my homemade natural cleaning supplies. From my antique library table to my unfinished wood kitchen countertops to my children’s many wooden toys (especially the hand-stained wooden toys), my homemade beeswax wood polish keeps them all in good condition, with all-natural ingredients and scented with essential oils. Here’s my recipe…. Why You Should Add Juicing to Your Diet – Plus Tailored Juicing Giveaway for $100 Worth of Gifts! Juicing will help your body feel rejuvenated, refreshed and will improve your health and energy level generally. Your immune system gets a boost from the antioxidants in juice, and by increasing the amount of fruit and vegetables in your diet you can avoid many common illnesses and disorders…. Natural fruit and vegetables are filled with the vitamins and minerals you need to be in prime condition. Certain fruits and vegetables contain certain vitamins and minerals which are specifically able to combat unique conditions. Tailored juicing is a system that combines these fruits and veggies to meet your specific needs. For example, citrus fruits such as lemons are filled with Vitamin C which is great for your skin, healing, and protection against conditions like scurvy. Cranberries are also known for their ‘super-fruit’ quality as they’re full of antioxidants to help combat UTIs and cystitis. Even more interesting, any fruits and vegetables that are orange in color such as carrots and pomegranates are filled with the pigment beta carotene which can reduce risk of heart disease and boost your immune system further still….